All Mingus asked for was the impossible. More often than not, he achieved it. Charles Mingus is the gift that keeps giving. With the exceptions of Miles Davis and John Coltrane, there is arguably no single jazz artist from the post-bop era whose body of work is as remotely vast, challenging and consistently fulfilling. 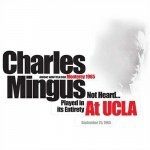 And now, thanks to the efforts of his indefatigable widow Sue Mingus, our wicked world just got a whole lot sweeter with the reissue of his historic concert at UCLA from 1965. Let’s go ahead and get it out of the way right up front: This recording is pretty much a miracle, and should be celebrated as such. The circumstances of its conception, performance, disappearance and resurrection seem not only appropriate, but almost uncannily reminiscent of the great man and his life, which too often seemed a ceaseless struggle between exasperation and ecstasy. The story of this recording is yet another installment of the underdog triumphs that defined Mingus’ creative and personal lives. Despite being a musician who’d been making well-regarded records for two decades, Mingus was still obliged to release this album on his own label, initially pressing a mere 200 copies (as always, he did as much as he could with whatever he had). Six years later, when he had the inclination and resources to try it again, he was distressed -- though probably not shocked -- to discover that the geniuses at Capitol Records had discarded the master tapes (along with other “obsolete custom tapes”, including some Mingus originals and, unforgivably, works by Charlie Parker!). It is, perhaps, difficult to appreciate -- or even conceive -- in our contemporary climate of spontaneous gratification, a time in the not terribly distant past where incalculable hours of concert and studio recordings were erased or shelved, if they were even recorded at all. Today, it is actually possible to attend a concert and purchase a freshly copied disc of the performance that just occurred. Suffice it to say, this concept was about as feasible as time travel while Mingus roamed the earth. In September 1965, Mingus returned to Monterey (where he had played an enthusiastically received set the year before) prepared to debut several new pieces he’d composed just for the occasion. For whatever reason, the band was not given anything approximating the time Mingus demanded, and deserved, and his sardonic and cantankerous assessment of the situation is aptly delineated in the complete album title: Music Written For Monterey, 1965. Not heard ... played in its entirety, at UCLA. Vols. 1 and 2. Mingus was more than capable of settling grievances -- real or imagined -- with his mind or his muscle, but mostly, what he wanted was the freedom and opportunity to express himself. Mingus brought an octet with him to Monterey (and then to UCLA) and some of the new material was written with the specific musicians in mind. Mingus often referred to his live engagements as “workshops”, partly because he was testing out new compositions, but also because the compositions were expected to evolve and mutate and, eventually, crystallize in a result Mingus found acceptable. He refused to hand out music or allow the band to write anything down on paper; all he asked was the impossible: he demanded polished improvisation, unscripted perfection -- and more often than not, it worked. When he got what he was looking for -- no matter how long it took -- the results remain unparalleled, and it’s not a coincidence that many of the musicians he took under his intimidating wing did their finest work, and invariably spoke fondly of their association with the maestro. Mingus, of course, was a stern taskmaster: he knew exactly what he wanted, but sometimes wasn’t certain what that was exactly, until he heard it. That his workshops became legendary is an understatement, and no musician (or loquacious member of the audience) was immune from the prodding, encouragement, threats and occasional violence Mingus would inflict if he deemed such measures necessary. The brilliance of the music assembled on this recording should not be surprising; Mingus was coming off the aforementioned triumph at Monterey the year before, and was less than two years removed from the release of what many consider his magnum opus, The Black Saint and the Sinner Lady, which employed more than double the number of musicians -- mostly quartets and quintets -- he was accustomed to working with. After indisputable masterpieces such as Mingus Ah Um, The Clown and Tijuana Moods already half a decade or more, behind him, he continued to push himself. The sheer audacity of several of these pieces clearly prodded the collective players harder and further than they’d ever gone, and a couple of compositions were not formally recorded until six years later, when they appeared on Let My Children Hear Music. The remarkable quality of the music aside, this recording is an invaluable history lesson of what Mingus sounded like as he struggled, in real time, to get it right, inspired by the high wire act of doing it in front of a paying crowd, and letting those folks watch him fly or die. That message, and this music, will be around as long as people are here to listen, but it certainly doesn’t hurt to have the 14-piece Mingus Big Band helping carry the torch almost 30 years after Mingus passed. Under the guidance of Sue Mingus, the band has been playing weekly (mostly in New York City, but also around the United States and the rest of the world) since 1991, and it would not be a stretch to suggest that this is the tightest, most interesting and exciting ensemble on the scene today. The Mingus Big Band is back with another incredible performance, Live in Tokyo, which is being released simultaneously with Music Written For Monterey .... Anyone fortunate enough to have captured this band in action understands that playing it safe is not their style, (not that it would even be possible to attempt a “safe” interpretation of a Mingus composition, as he was stylistically allergic to conformity or cliché). On this set, recorded on New Year’s Eve 2005, familiar favorites such as “Bird Calls” and “Ecclusiastics” are performed along with lesser known gems like “Opus Four” and “Prayer For Passive Resistance”. The highlight of these proceedings is the sublime “Celia”, yet another masterwork from 1957’s East Coasting, which captures the languid and sensitive piano work of Bill Evans -- who played on the original -- with a wonderful solo by Craig Handy on alto sax. This is important music given new life by an important band, and should not be missed.